Wonderful 3 bed south facing house, meaning sun all day, on a private 4 pool complex. One of the few properties that over looks the pools, dining al fresco, on a stunning location. Close to shops /bars/restaurants. 5 min. walk to the fabulous ''acua'' water park and ''animal experience'' park ideal for every age, crazy golf, children playground and bowling. Market every Monday and Friday morning until 1pm at acua. Beaches are a 10 minute stroll away. The beautiful white dunes beaches a little further, buses and taxis are readily and easily available. The striking lights of Corralejos shopping centre El Campanario ''the bell ringer'' are visible North of the complex and from the 3rd level terrace, with spectacular views of Lobos island right across to Lanzarote. Two bathrooms,: One upstairs, one downstairs. Ground floor bathroom: Toilet/bath with shower/bidet/vanity unit. Washing machine also. First floor bathroom: toilet/shower/wash hand basin. Very fast and reliable WiFi with Spain's leading internet provider, Movistar. Smart TV with access to NetFlix and YouTube. Variety of children's Toy's provided. The complex and our property is wheelchair friendly. The complex has ramps for easy access across the complex. The property has wide doors and space available to accommodate guests with disabilities. Beautiful complex, home from home, everything you need. Lots of space. Managers were great. The casa was great everything you need in a holiday home. Complex was beautiful, nice and quite. pool area very clean and just 5 steps from casa. Would definitely recommend. There is a bit of a walk to main street 20mins but nice enough walk and we enjoyed that anyway. 2 Supermarkets close one front and at the back. And a lovely shopping area at the Bell Tower with places to eat and have a drink. Also great bar close Clarkies and do great English food. With - Tiffanys round the corner from there for breakfast. Overall an amazing holiday everything we wanted. Would defo stay again. The complex is very secure and the area is quiet and pleasant. It's a great place to relax and only a few minutes walk to the Campanari shopping centre. The apartment was clean and three terraces, from the ground floor to the roof terrace, gives you plenty of chilling space. It might not be a good fit for 6 people but I would certainly recommend this apartment otherwise. We really enjoyed our stay and wouldn't hesitate to return. Great property close to the beaches and shopping centre. Everything as described. Lovely! The apartment is first class, everything was immaculate. It is very spacious and comfortable in a very secure and well kept complex. It had everything that you needed - well stocked larder, DVD's, books, etc. The owners were very easy to deal with and extremely helpful with any questions. The pool area was very clean. The location is good - about a 15 minute walk into the centre of Corralejo but we hired bikes around the corner from El Sultan. There are cycle lanes everywhere so very safe to get around. I would highly recommend staying here and look forward to returning. This property was perfect, balcony -yes, roof top -yes, barbq -yes, pool -yes, private gated residence -yes. Loved staying here, it's a lovely size and the owner and staff could not have been more helpful. This is a beautiful house in the sun,location just beside the pools.The complex is clean and we liked the fact it is also gated.We look forward to returning sometime.Thank you Declan for letting us stay in your casa. With miles of beautiful golden blue flag beaches, Fuerteventura is the most natural and unspoiled of the Canary Islands. Stunning turquoise seas and 3000 hours of sunshine , perfect all year round destination and world famous for wind surfing. Corralejo town has an abundance of shops/bars/restaurants from the Spanish old town right up to main street to the new town. Stroll down to the harbour and arrange a trip over to Lanzarote or Lobos island, plenty of trips to choose from. 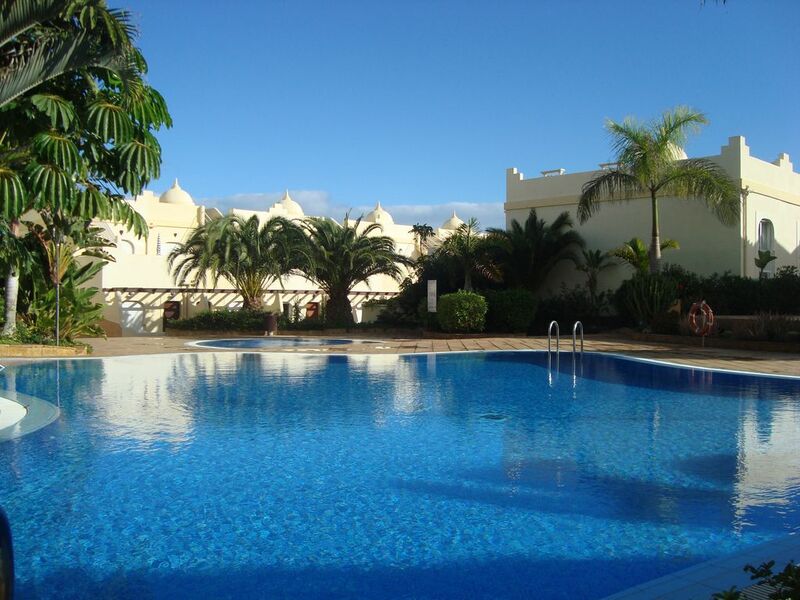 Golf: Corralejo golf course, Mirador de Lobos Parque, is a five minute drive from town centre. Caleta de Fuste golf course 30 min. drive away by car or taxi, you can also take the bus. Prices start from €580 [EURO] Price includes all expenses such as cleaning, lighting,internet,linen,water, towels,safe,fans in all rooms six sun beds,meet and greet service by english management,free welcome pack on arrival. . Contact owner for precise price depending on seasons. Prices are for House per week in Euros, Above rates are for four people sharing extra guests will be charged €100 euros per week extra booking for this villa will be confirmed by e-mail and secured on receipt of payment.Free Welcome pack provided on your arrival.